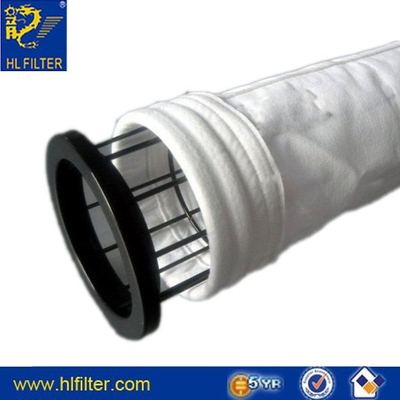 Teflon PTFE dust filter bag (Fluorocarbon fiber/Polytetraflouroethylene aka PTFE). Normal maximum continuous operating temperature is 240degrees. Generally used for severe chemical environments at high temperatures. Common applications include coal-fired power plants, cement production, and steel foundries. everything else has failed. Teflon is available in both a woven and a felt finished product. This media has poor flex abrasion qualities and requires a 20 vertical wire minimum support cage when used in tubular bag form.